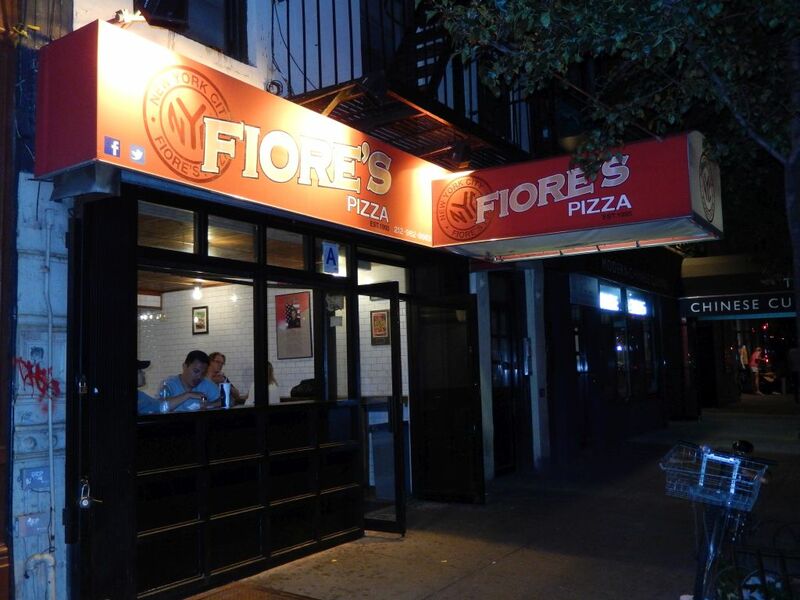 Fiore’s Pizza on Bleecker Street— A Shining Star of a Slice! Well, after a late summer night musical experience at the City Winery, it was a nice evening for a stroll through the Village. Of course I had getting a slice of pizza on my mind, and seeing Fiore’s, I said “What the heck?” Unexpectedly, this casual decision resulted in one of the most delightfully surprising adventures in Pizza Snob history! Peeking through Fiore’s open air façade, I spotted delivery activity behind the counter and a handful of patrons in the square front dining area. In the rear was perhaps the biggest pizza oven I had even seen—a massive machine against the back wall! I found that Fiore’s sells pizza, calzone, rolls and salad with beers available to wash them down. My pizza senses detected that the product in the counter display was something other than your typical NY street slice. The regular cheese slice looked solid and crisp with blotchy cheese (made from cubes) and a darker richer tomato sauce. I was getting quite interested! My interest however took a back seat to the guy working the counter. He was certainly no “Pizza Nazi” and spent several minutes fumbling with the previous customer’s credit card payment before casually requesting my order. “Mr. Casual” eventually reheated my cheese slice selection ($2.50) to an absolute perfect temperature for consumption. It was good and hot throughout, but safe from any mouth-scalding danger. 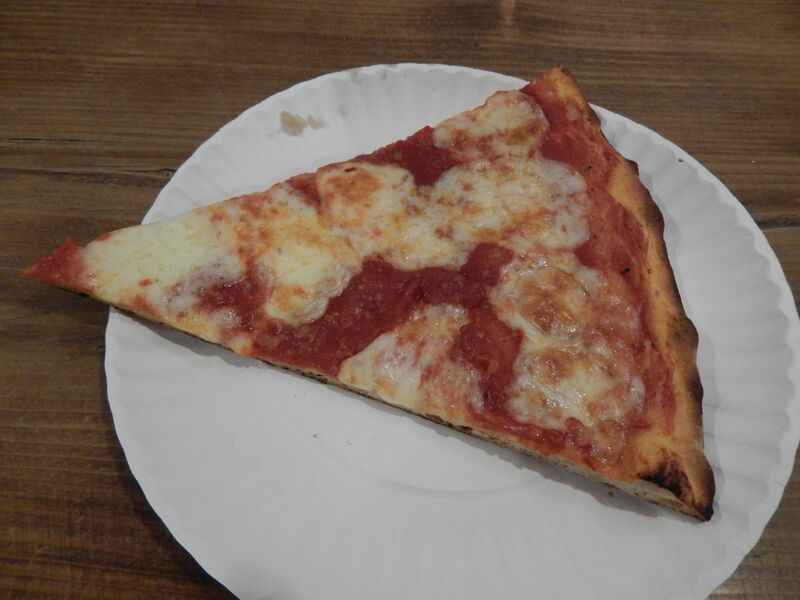 I immediately realized that Fiore’s slice was rock solid crisp with a firm crunchy crust. When I folded it, I could even hear an audible cracking sound. It sized up being on the thin side with pizza bones that retained this slimness to the very end. 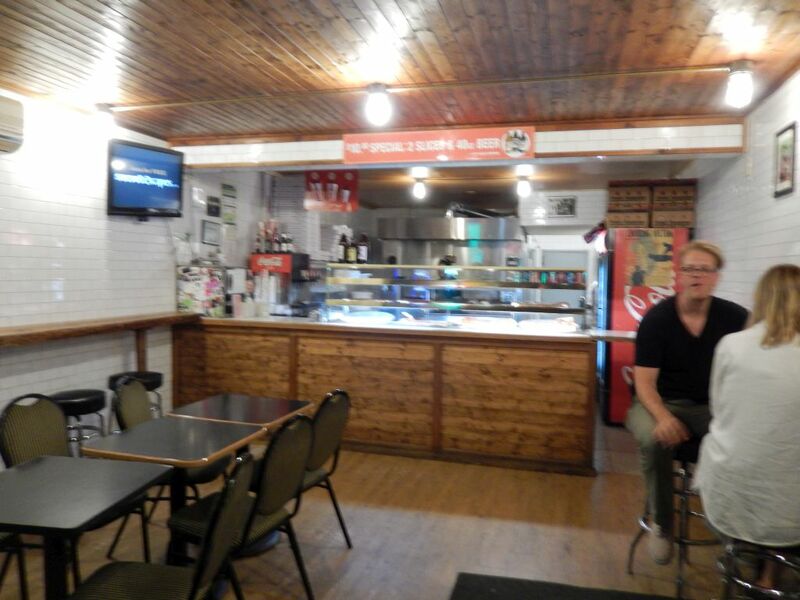 I really was taken with how classy Fiore’s slice looked. The light oil on top of the cheese and tomato sauce gave it a nice sheen that was tempting and enticing to the taste buds. The tomato sauce was tasty, tangy and perhaps borderline sweet while the cheese was just right. Biting through that crunch, I found this slice simply dee-lish! Everything was just so fresh and tasty that it was hard for me to refrain from having another. I joyfully departed knowing that I would be welcoming this shining star of a slice into the Pizza Snob Hall of Fame. This is one I can’t wait to try again. P.S. I was touched to learn that the owner named his pizza joint in honor of his good friend, Mike Fiore, a firefighter who lost his life on 9/11.